Eric Fryer's two-out RBI double in the bottom of the eighth inning lifted the Cardinals to a 4-3 victory over the Reds on Sunday afternoon and gave them two of three in the series. Cincinnati will return home having lost five of its six games on the road trip. When the Cardinals summoned Aledmys Diaz to pinch-hit to lead off the eighth, the Reds removed left-handed reliever Tony Cingrani in favor of right-hander Ross Ohlendorf. Diaz drew the walk before Ohlendorf picked up the next two outs. On a 1-0 count, Fryer lined a fastball through the gap in left-center field that scored Diaz from first base with the go-ahead run. "[Fryer] was able to get one between the outfielders, which other than one over the fence or right down the line is the only way he's going to get that runner in from first," Reds manager Bryan Price said. "But he came up with the big hit, that's what it came down to. They had the last big play and they executed. That was the difference." Said Fryer: "I know Ohlendorf likes to come at guys with his fastball, especially away. I was looking out over the plate and he ran one out over the plate probably a little more than he wanted to, and I got the head through and put a good swing on it." Cardinals lefty reliever Kevin Siegrist struck out three over 1 1/3 scoreless innings for the victory. Trevor Rosenthal struck out a pair in a perfect ninth for his third save. St. Louis has won seven of its last nine games. Red-hot Fryer: Making his first start of the season in place of catcher Yadier Molina, Fryer went 3-for-3 and walked in his four plate appearances while driving in a pair of runs. His biggest hit was a double to the center-field wall that scored Diaz for the eventual game-winning run. Fryer, who made the roster after Brayan Pena injured his knee late in Spring Training, is 6-for-6 on the season, and he threw out Brandon Phillips trying to steal in the sixth. Wacha limits damage: Michael Wacha was hit hard in the first and had to pitch through two fielding errors, one of which was his own, in the fourth. After giving up a double and a single to the first two batters of the game, Wacha picked off Eugenio Suarez at first base to hold the Reds to one run. 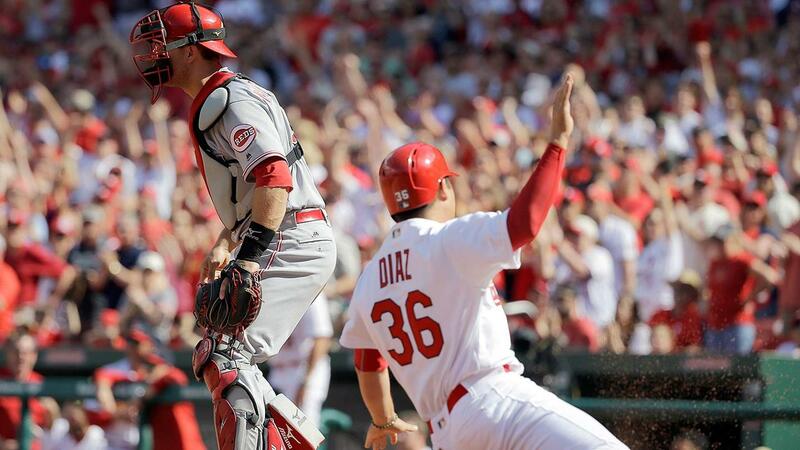 After the back-to-back errors in the fourth, Wacha got Adam Duvall to ground into a double play to end the rally. Moscot debuts: Reds starting pitcher Jon Moscot came off the disabled list and made his 2016 debut with 5 2/3 innings, three earned runs, six hits, one walk and two strikeouts. Moscot, who gave up Jedd Gyorko's solo homer in the second inning and Matt Carpenter's leadoff homer in the fifth, threw 102 pitches. He did not complete the sixth after he hit a batter and walked another with two outs. It was his first start in the big leagues since he separated his non-throwing shoulder on June 15 at Detroit. In the top of the fourth inning when Cincinnati held a 3-2 lead, Duvall grounded into what was called a 5-4-3 double play. The Reds thought Duvall beat the throw to first base and challenged the call. After a replay review, it was determined that the call stands because it was not definitive that Duvall's foot touched first base in time. In the bottom of the sixth inning, with the score tied at 3, Greg Garcia took an inside pitch that was called a ball. The Cardinals thought the pitch grazed Garcia. After a replay review, the call was overturned and Garcia was awarded first. Reds: A seven-game homestand begins at 7:10 p.m. ET Monday with the first of three games vs. the Rockies. A change in the rotation will have Dan Straily making his first start of the season, with Alfredo Simon pushed back to Tuesday. Straily has made three solid long relief appearances and has a 3.24 ERA over 8 1/3 innings. He last pitched three innings on Friday at St. Louis and allowed a solo homer. Cardinals: Mike Leake will make his third start of the season as the Cardinals continue their nine-game homestand by opening a three-game set against the Chicago Cubs at 7:09 p.m. CT on Monday. Leake (0-1, 6.97 ERA) is looking for his first quality start of the season. The Cubs will counter with former Cardinal John Lackey.